Wolfe's notes and thoughts have now been compiled in a book titled Urbanism Without Effort, published one week ago by Island Press and already a steady bestseller. "A must-read" says the blurb from none other than Seattle Mayor Mike McGinn on the publisher's website. 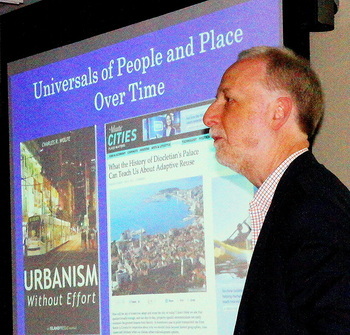 Urbanism Without Effort is both Wolfe's title and his motto. He recognizes that the term "built environment" means different things to different people. Paris is Paris, and Seattle is Seattle, but each person's Paris, each person's Seattle, is different. Radical as it may seem: you have to figure your city out for yourself. Two years ago, in a column published by Huffington Post, Wolfe articulated his notion that the way to understand the urban environment was, simply, to record it. Wolfe urged his readers to bypass the academic debates over what, precisely, should be recorded, and how, precisely, it should be interpreted. Instead, he posited a citizen-journalist's approach: just observe. (Wolfe's father was a respected professor of urban design at the University of Washington who taught him that the most important thing you can do is learn how to see.) Go for a walk and write a paragraph about the experience. Take pictures of locations in your neighborhood. Videotape street life around you. Wolfe's manifesto up-ends the power structure of academics, architects and bureaucratic city planners in much the same way that hyper-local blogging eroded the power structure of newspapers. The result is, first, a challenge: pay attention to your surroundings, everyone! And second, to empower individuals, to give them permission not just to look at the streetscape and the trees but to react to them. Of course, you say, that's nothing new. People have always done that. Exactly! Urban planning isn't some newfangled notion dreamed up by dwellers of an ivory tower, it's always been there;from the very first settlements, man has built what was needed for protection and food with the most readily available materials. And bureaucracy has often imposed solutions that are less than ideal. "Why shouldn't we have zip-lines between Italian hill towns?" Wolfe asks. "For that matter, why shouldn't we have them in Seattle parks?" In the end, the problem with urban planning is precisely that it looks upon the built environment as a problem in need of a solution, however admirable (comfort, entertainment, "walkability"), to be engineered through incentives for developers to act in a certain way. But people, says Wolfe, are far more resourceful. Politicians look for a desired outcome; citizens look for what works. That alley in Madrona with a concrete retaining wall? It becomes the screen for summer movies, the nexus of a community, an entry in Wolfe's own urban diary. What a radical concept! This page contains a single entry by Cornichon published on May 8, 2013 11:00 PM. NYT says "Go to Marseille" was the previous entry in this blog. The Mediocre Gatsby is the next entry in this blog.